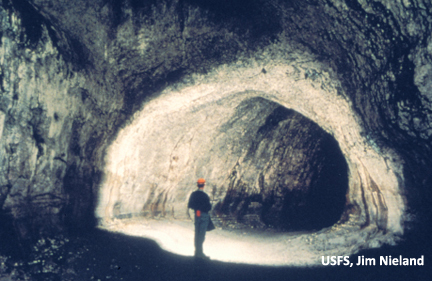 Ape Cave, the third longest lava tube in North America, provides moderate to difficult terrain. Visitors to the cave need to be prepared for constant 42 degree F temperature, pitch black conditions and uneven and sometimes slippery surfaces. Two light sources per person, warm clothes and sturdy shoes are essential. From late June until early September, a bookstore and ranger-guided cave tours are available. Heavy use of the cave, during the peak hours of 11 a.m. to 3 p.m. on weekend days, creates a less than desired experience and parking issues. Plan your visit around these peak-use times and days for a more positive cave experience. Access is via Forest Roads 25, 83 and 8303 (roads are generally snow-free between early May and the end of October). Explore a lava tube formed by eruptions 2000 years ago. White-Nose Syndrome (WNS), named because of the telltale white fungal growth on the nose of affected bats, is responsible for the most dramatic wildlife decline in 100 years. Affected bats wake up and fly around when they should be hibernating, using up vital fat reserves needed for winter survival. WNS has spread throughout eastern and central U.S. and Canada leading to the deaths of over seven million bats. YOU CAN HELP STOP THE SPREAD OF WHITE-NOSE SYNDROME AND PROTECT OUR CAVE ECOSYSTEM! It is believed that people are responsible for spreading the disease from cave to cave. To minimize the potential that YOU will spread the fungus to Western caves, do not bring ANY item (gear, clothing, boots, etc.) 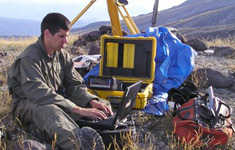 that has been used in caves or mines outside Washington or Oregon into any of the caves or mines in these states.